Everyone who plays in online casinos can tell you the benefits over going to a land-based establishment. It's easier to get started, you have less invested in travel and tips, you can bet at smaller stakes and you can get better bonuses and comps. Even with these benefits, there are still a lot of people out there who would prefer, for one reason or another, to have live people dealing their cards and turning their wheels. Casino Noir realizes this, and that's why they have something just for players who want this without having to leave the house. Casino Noir has recently added live French dealer games to their offering. These games are available around the clock, 24/7/365, and they give you a chance to enjoy a live dealer environment for some of the most popular traditional casino games. 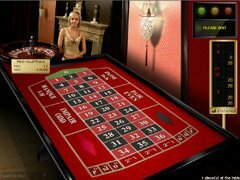 The main offering for the live dealer casino at Casino Noir consists of live blackjack, live baccarat and live roulette. These are the main three games that people prefer to play in a live setting, and Casino Noir is bringing them to you so that you can enjoy seeing real people deal real cards and spin real wheels to determine the outcomes of your bets. This news comes about a month after Casino Noir's partner 7Red Casino added their own live dealer games. They have the same selection of Baccarat, roulette and blackjack. 7Red Casino has made the news lately on its own after picking up some recognition at the most recent International Gaming Awards. They picked up the prize for the Best Mobile Operator at this year's IGAs, and this is a huge deal because it means they have won this award for three years in a row. On top of that, 7Red Casino also picked up the Gaming Industry Fair Play award. You have plenty of reasons to check out the new live dealer games at Casino Noir. To start things off, you can get a €5 free no deposit bonus just for signing up that you can use to check out their software. When you're ready to put in your first deposit, you can get a 100 percent match that's especially for new players and that's worth up to €250. You can get plenty of other offers at this site available, plus they have a complete selection of top-tier slots and other games thanks to the software provided by BetSoft.